Sustainable Aquatics is happy to announce the availability of a species we have been working with for several years. Our Epaulette sharks had their first fertile eggs last year. After several months of incubation, the sharks began to hatch. This spring we are proud to offer healthy tank-bred Epaulette shark pups! The Epaulette shark (Hemiscyllium ocellatum) is a shark of the order Orectolobiformes, the carpet sharks, which includes such diverse members as nurse sharks, whale sharks, wobbegongs, and zebra sharks. The Epaulette shark is named for the prominent black spots behind the pectoral fins. Epaulettes are one of the better choices as an aquarium shark due to their smaller size and peaceful disposition. Their diet consists mostly of worms, crabs, shrimp, and fish. Our sharks are aggressively eating a variety of frozen foods, including shrimp, mussel, fish, and gelatin diets. They are generally more active during the night-time hours and appreciate a shaded place to rest during the day. The Sustainable Islands Project is adding a new fish to the availability this week: the Engineer Goby or Convict Blenny, Pholidichthys leucotaenia. Neither a true blenny nor goby, this unusual fish is a member of its own family Pholidicthyidae. When young, these fish form large schools and hover over the reef. As they age and grow, they settle into burrows in the reef. They grow quickly to over 1’ due to their large appetites for most aquarium fare, and their patterns change from horizontal white stripes to yellow or golden vertical markings. The Engineer Goby is a robust aquarium fish that should be provided with regular feedings and substrate or hiding places as it grows. Juveniles do well in groups and are generally peaceful with other aquarium inhabitants. 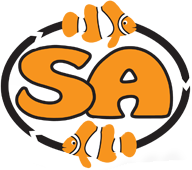 Our most popular fish, the common orange Amphiprion ocellaris, is always available in several sizes. The beautiful bright orange SA ocellaris makes for a hardy and long-lived pet. SA rarely sees misbarring in this variety, but we do sometimes see mutations or defects within the large number of these fish that are in our care. This week we are offering a limited number of “Stubby” ocellaris. These fish are missing some vertebrae and are shorter than the standard fish. Although they have a different shape and are generally smaller than the standard ocellaris, they are otherwise no different from our standard fish. A favorite with the SA hatchery personnel who are glad to send them to new homes but sad to see them go!